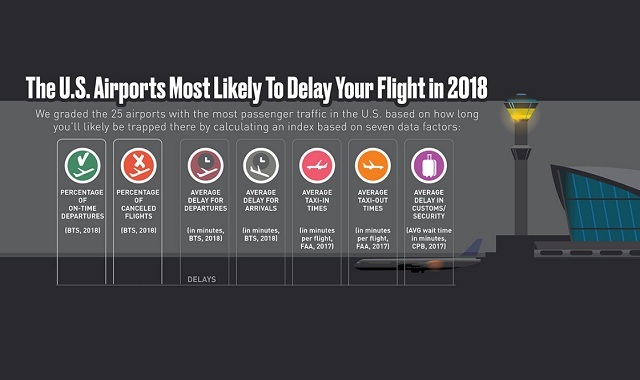 These Are the Airports That Are Most Likely to Delay Your Flight This Christmas #infographic ~ Visualistan '+g+"
Traveling around Christmas time to visit family can be a hassle, especially if you need to fly. It's one of the busiest times of the year for airports and it can cause lengthy travel delays that can leave you sleeping overnight in the terminal. "Well is there anything I can do to make Christmas travel easier?" Why, yes, there is! The best way is to get educated and learn about which airports will be likely to get you to your destination (and your family) on time. "Well how can I do that?" Look no further than this infographic! This data visualization was created by travel guru Asher Fergusson from Asher & Lyric (they also create a lot of user infinitely useful travel content on AsherFergusson.com) and used seven different data factors to create a "delay index" and assign a score to the 25 busiest airports in the United States. As it turns out, the three worst airports that are most likely to delay your flight are all in the New York City area! JFK, EWR, and LGA have been graded and F, F, and D respectively. We certainly plan on taking Asher's advice and avoid these airports this holiday season!